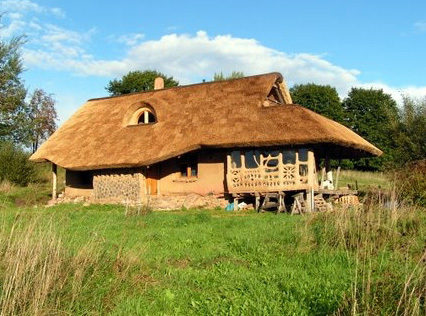 Planning Your Dream Natural Building Home Workshop UK 11-15 Aug 2015. Workshops are always lots of fun! THE NEXT TIME THIS WORKSHOP WILL RUN IS 2016 – THE DATES FOR THIS WILL BE ANNOUNCED IN NOVEMBER. Tuesday 11th – Saturday 15th August 2015. 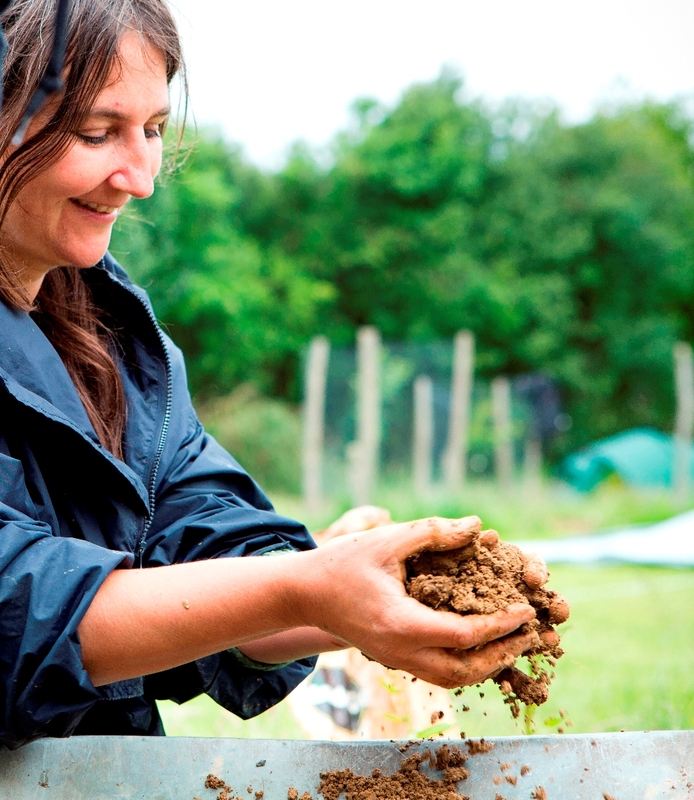 Taught by architect and earthbag author Paulina Wojciechowska, and Antony Dennis. The workshop will be held in a lovely farm set in rolling english countryside 15 minutes drive from London Gatwick airport. This workshop is a combination of lots of hands on experience combined with lectures and discussion to help you plan your dream home made from natural materials. Paulina has designed a dream home which will be built from natural materials at the workshop site of Oaklands Farm over the next two years, and the design and site will be used as a real-life example to gain hands-on experience of the ideas presented in the workshop. The workshop covers all areas of planning your home, from choosing a site, through planning the design, to an awareness of what is involved in all aspects of the build so you can plan what you can do and what will require the help of others. Throughout the five days, the workshop is 50% presentation and discussion, and 50% hands-on practical work. Dealing with the site’s characteristics such as earth types, ground topology, etc. The balance of costs: money, time, quality. Fitting the project into your life. A design example: the amazing 5 bedroom house being built at Oaklands Farm. Feng Shui – presented by Laurent Langlais. Click here for more details about Laurent. Foundations: types of foundations, pros and cons, which to use in different site situations, relative costs and effort involved. Roof structures: types of roofs, pros and cons, how to choose the best roof structure for your project, relative costs and effort involved. Insulation: a discussion of different solutions and their relative effectiveness. Walls: an overview of natural building wall technologies: straw bale, cordwood, earthbag, cobb, rammed earth, old tyres. Floors: an overview of the different technologies, their pros and cons. Balancing your idealogical ideas with your building inspector’s logical, legal ones. Hands-on experience: building walls for the Oaklands Farm project from cordwood, earthbag and cobb. Many people come to our workshops with plans and ideas for their house and site design. We will select up to three design ideas from participants to be reviewed by Paulina during the workshop and presented to the group on the last day for further discussion. Many of our attendees have specialist knowledge on particular areas of design, construction or permaculture, and it can be a valuable experience to share that knowledge. Please let us know with your workshop application if you would like your design ideas to be reviewed and presented. Constructing some of the foundations on the project at Oaklands Farm. Constructing part of a rainwater drainage system. Working with electrical wiring, sockets and lights. Working with plumbing and waste water parts. The price of the five day workshop is £265 per person, or a discounted price of £235 is available if booked by 1st July 2015. 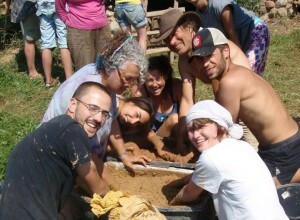 Note that immediately after this workshop, we will run a five day workshop on how to build with straw bales, and a further two days on in-depth clay plastering techniques. Numbers on the workshop will be limited to ensure a good learning experience, and we are expecting the allocated places to fill up before the workshop begins. Children from the age of 8 are welcome to accompany their parent(s) and may participate in parts of the workshop as they wish. No charges are made for children under the age of 18 years. call Antony on (+44) 7812 070413. The workshop will be lead by Earth, Hands and Houses founder Paulina Wojciechowska, a qualified architect who has over 17 years of experience building with straw bales and earthbags in communities all around the world. Paulina worked alongside Nader Khalili at Cal-Earth in 1996 and is the author of “Building with Earth”, one of the leading earthbag construction books. She also worked with leading straw bale and clay plaster veterans Bill and Athena Steen in 1997-8 and has been involved in running straw bale and earthbag workshops and designing and building straw bale structures since then. Click here to hear Paulina talk about her experiences. Vegetarian food will be available at an additional cost, payable upon arrival. The food will comprise a self service breakfast, full cooked lunchtime meal, and a light supper. The workshop will be held at Oaklands Farm, which is a 15 minute drive south of London Gatwick airport. You may camp at the farm for free. Click here for more details of the camping facilities, maps, travel information and other accommodation available. Day 1: from 10:00 to 18:00. You are welcome to arrive on the afternoon of the day before to set up camp and settle in before the workshop begins. Days 2-4: from 09:00 to 17:00. Day 5: from 09:00 to 16:00. If you are camping, you are welcome to stay on until the following morning if you wish. This will be more than just a natural building workshop – it will be a wonderful opportunity to enjoy learning and relaxing amongst like minded people, some who may become your friends for life! This entry was posted in Past Workshop on August 2, 2014 by Antony Dennis.